Leroy "Roy" Buchanan (September 23, 1939 – August 14, 1988) was an American guitarist and blues musician. A pioneer of the Telecaster sound, Buchanan worked as a sideman and as a solo artist, with two gold albums early in his career and two later solo albums that made it to the Billboard chart. He never achieved stardom, but he is still considered a highly influential guitar player. Guitar Player praised him as having one of the "50 Greatest Tones of All Time." He appeared on the PBS music program Austin City Limits in 1977 (season 2). Leroy Buchanan was born in Ozark, Arkansas, and was raised there and in Pixley, California, a farming area near Bakersfield. His father was a sharecropper in Arkansas and a farm laborer in California. Buchanan told interviewers that his father was also a Pentecostal preacher, a note repeated in Guitar Player magazine but disputed by his older brother J.D.. Buchanan told how his first musical memories were of racially mixed revival meetings he attended with his mother, Minnie. "Gospel," he recalled, "that's how I first got into black music." He in fact drew upon many disparate influences while learning to play the guitar (though he later claimed his aptitude derived from being "half-wolf"). He initially showed talent on steel guitar before switching to guitar in the early 50s, and started his professional career at age 15, in Johnny Otis's rhythm and blues revue. In 1958, Buchanan made his recording debut accompanying Dale Hawkins (Buchanan played the solo on "My Babe") for Chicago's Chess Records. Two years later, during a tour through Toronto, Buchanan left Dale Hawkins to play for his cousin Ronnie Hawkins and tutor Ronnie's guitar player, Robbie Robertson. Buchanan plays bass on the Ronnie Hawkins single "Who Do You Love?". Buchanan soon returned to the United States, and members of the Ronnie Hawkins' group later gained fame as the roots rock group The Band. In the early 1960s, Buchanan often played as a sideman with various rock bands, and he played guitar in recording sessions with Freddy Cannon, Merle Kilgore, and others. At the end of the 1960s, with a growing family, Buchanan left the music industry to learn a trade and was trained as a hairdresser (barber). However, in the early 1970s he performed in the Washington, D.C.–Maryland–Virginia area with the Danny Denver Band, which had a following in the area. Buchanan was also popular as a solo act in the D.C. area at this time. In 1961 he released "Mule Train Stomp", his first single for Swan, featuring rich guitar tones. Buchanan's 1962 recording with drummer Bobby Gregg, nicknamed "Potato Peeler," first introduced the trademark Buchanan "pinch" harmonic. An effort to cash in on the British Invasion caught Buchanan with the British Walkers. In the mid-1960s, Buchanan settled down in the Washington, D.C., area, playing for Danny Denver's band for many years while acquiring a reputation as "...one of the very finest rock guitarists around. Jimi Hendrix would not take up the challenge of a 'pick-off' with Roy." The facts behind that claim are that in March 1968 a photographer friend, John Gossage gave Buchanan tickets to a concert by the Jimi Hendrix Experience at the Washington Hilton. "Buchanan was dismayed to find his own trademark sounds, like the wah-wah that he'd painstakingly produced with his hands and his Telecaster, created by electronic pedals. He could never attempt Hendrix's stage show, and this realization refocused him on his own quintessentially American roots-style guitar picking." Gossage recalls how Roy was very impressed by the Hendrix 1967 debut album Are You Experienced?, which was why he made sure to give Roy a ticket to the early show at the Hilton. Gossage went backstage to take photos and tried to convince Jimi to go and see Roy at the Silver Dollar that night after the show, but Jimi seemed more interested in hanging out with the young lady who was backstage with him. Gossage confirms Hendrix never showed up at the Silver Dollar, but he did talk to Roy about seeing the Hilton show. That same night (as the Hilton show) Roy did several Hendrix numbers and "from that point on, had nothing but good things to say about Hendrix". He later released recordings of the Hendrix composition "If 6 Was 9" and the Hendrix hit "Hey Joe" (written by Billy Roberts and first recorded by The Leaves). Buchanan's life changed in 1971, when he gained national notice as the result of an hour-long PBS television documentary. 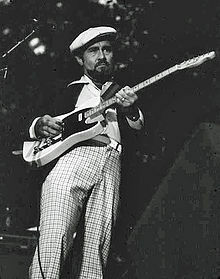 Entitled Introducing Roy Buchanan, and sometimes mistakenly called The Best Unknown Guitarist in the World, it earned a record deal with Polydor Records and praise from John Lennon and Merle Haggard, besides an alleged invitation to join the Rolling Stones which he turned down and which gave him the nickname "the man who turned the Stones down". In 1977, he appeared on the PBS music program Austin City Limits during Season 2. He recorded five albums for Polydor, one of which, Second Album, went gold, and after that another three for Atlantic Records, one of which, 1977's Loading Zone, also went gold. Buchanan quit recording in 1981, vowing never to enter a studio again unless he could record his own music his own way. Four years later, Alligator Records coaxed Buchanan back into the studio. His first album for Alligator, When a Guitar Plays the Blues, was released in the spring of 1985. It was the first time he had total artistic freedom in the studio. His second Alligator LP, Dancing on the Edge (with vocals on three tracks by Delbert McClinton), was released in the fall of 1986. He released the twelfth and last album of his career, Hot Wires, in 1987. According to his agent and others, Buchanan was doing well, having gained control of his drinking habit and playing again, when he was arrested for public intoxication after a domestic dispute. He was found hanged from his own shirt in a jail cell on August 14, 1988, in the Fairfax County, Virginia, Jail. According to Thomas Hartman, who was in a cell near Buchanan's, the deputy sheriff opened the door early in the morning and found Buchanan with the shirt around his neck. Buchanan's last show was on August 7, 1988, at Guilford Fairgrounds in Guilford, Connecticut. His cause of death was officially recorded as suicide, a finding disputed by Buchanan's friends and family. One of his friends, Marc Fisher, reported seeing Roy's body with bruises on the head. After his death, compilation and other albums continue to be released, including in 2004 the never-released first album he recorded for Polydor, The Prophet. Roy Buchanan is interred at Columbia Gardens Cemetery in Arlington, Virginia. Buchanan used a number of guitars in his career, although he was most often associated with a 1953 Fender Telecaster, serial number 2324, nicknamed "Nancy." At some point "Nancy" had jumbo frets installed, but remained largely original. There are two very different stories explaining how Buchanan got the guitar. He himself said that, while enrolled in 1969 in a school to learn to be a hairdresser, he ran after a guy walking down the street with that guitar, and bought him a purple Telecaster to trade. A friend of Buchanan's, however, said that Buchanan was playing a Gibson Les Paul at the time, and traded it for the '53 Tele. One of Buchanan's Telecasters was later owned by Danny Gatton and Mike Stern, who lost it in a robbery. Buchanan achieved his sound through minimum means. He played the Telecaster through a Fender Vibrolux amplifier with the volume and tone "full out," and used the guitar's volume and tone controls to control volume and sound (he achieved a wah wah effect using the tone control). To achieve his desired distorted sounds, Buchanan at one point used a razor blade to slit the paper cones of the speakers in his amp, an approach also employed by the Kinks' Dave Davies and others. Buchanan rarely used effects pedals, though he started using an Echoplex on A Street Called Straight (1976). In his later career he played with a Boss DD-2 delay. Buchanan taught himself various playing techniques, including "chicken picking". He sometimes used his thumb nail rather than a plectrum, and also employed it to augment his index finger and pick. Holding the pick between his thumb and forefinger, Buchanan also plucked the string and simultaneously touched it lightly with the lower edge of his thumb at one of the harmonic nodes, thus suppressing lower overtones and emphasising the harmonic, sometimes referred to as pinch harmonics, though Buchanan called it an "overtone." Buchanan could play harmonics at will, and could mute individual strings with free right-hand fingers while picking or pinching others. He was famous as well for his oblique bends. Having first played lap steel guitar, Buchanan often imitated its effect and bent strings to the required pitch, rather than starting on the desired note. This was particularly notable in his approach to using double and triple stops. Buchanan has influenced many guitarists, including Robbie Robertson, Gary Moore, Danny Gatton, Arlen Roth, Jeff Beck, David Gilmour, Jerry Garcia, Mick Ronson, Jim Campilongo, and Steve Kimock; Beck dedicated his version of "Cause We've Ended As Lovers" from Blow by Blow to him. His work is said to "stretch the limits of the electric guitar," and he is praised for "his subtlety of tone and the breadth of his knowledge, from the blackest of blues to moaning R&B and clean, concise, bone-deep rock 'n' roll." In 2004, Guitar Player listed his version of "Sweet Dreams," from his debut album on Polydor, Roy Buchanan, as having one of the "50 Greatest Tones of All Time." In the same year, the readers of Guitar Player voted Buchanan #46 in a top 50 readers' poll. Roy is the subject of Freddy Blohm's song "King of a Small Room." ^ a b c Blackett, Matt (October 2004). "The 50 Greatest Tones of All Time". Guitar Player. 38 (10): 44–66. ^ a b c "Roy Buchanan, 48, a Guitarist". New York Times. August 17, 1988. Retrieved April 30, 2009. ^ a b Harrington, Richard (August 21, 1988). "Roy Buchanan, A Study in Blues: The Gifted Guitarist and His Road Less Traveled". Washington Post. Archived from the original on November 4, 2012. Retrieved April 30, 2009. ^ a b c d e Carson, Phil (2001). Roy Buchanan: American Axe. San Francisco: Backbeat Books. ISBN 0-87930-639-4. ^ a b c d e f Cauffiel, Lowell (July 1993). "A Long-Lost Lesson: Roy Buchanan". Guitar Player. pp. 46–54. ^ a b c d Carson, Phil (August 1999). "The Life and Times of Roy Buchanan". Sweet Dreams of Roy Buchanan. Retrieved January 6, 2009. ^ Rockwell, John (April 15, 1973). "Buchanan? Crazy". New York Times. Retrieved April 30, 2009. ^ a b c d Levy, Adam (May 2001). "Rev. of Roy Buchanan, Deluxe Edition/Johnny Winter, Deluxe Edition". Guitar Player. pp. 135–36. ^ a b "Roy Buchanan, 48; guitarist set new musical standards". Chicago Sun-Times. August 16, 1988. Archived from the original on November 4, 2012. Retrieved April 30, 2009. ^ a b Davis, Patricia; Sandra Evans (August 17, 1988). "Roy Buchanan, Guitarist, Found Hanged in Va. Jail; Artist Faced Alcohol Charge". The Washington Post. p. B3. ^ Joyce, Mike (December 16, 1987). "Alligator's Cutting Edge; Delivering the Blues, From Buchanan to Chicago". The Washington Post. Retrieved April 30, 2009. ^ a b c d e Balmer, Paul (2009). The Fender Telecaster Handbook: How To Buy, Maintain, Set Up, Troubleshoot, and Modify Your Tele. MBI Publishing. p. 168. ISBN 978-0-7603-3646-5. ^ Carson, Phil (January 2002). "Roadhouse Wizard: An Exclusive Preview of Roy Buchanan, American Axe". Guitar Player. pp. 102–106. ^ Gold, Jude (June 2007). "Mike Stern". Guitar Player. pp. 28–30. ^ Cauffiel, Lowell (September 2008). "Flashback: Roy Buchanan October 1976". Guitar Player. p. 192. ^ Ellis, Andy (May 2005). "Lead Guitar 101: Wrenching Triple-String Oblique Bends". Guitar Player. p. 39. ^ Fox, Darrin (October 2007). "Gary Moore". Guitar Player. pp. 66–72. ^ Fox, Darrin (November 2005). "Oeuvre Easy: Roy Buchanan". Guitar Player. p. 44. ^ Blackett, Matt (December 2000). "Pure Genius: Guitar's Magnificent Rebel Puts a Twist on Techno". Guitar Player. pp. 98–106. ^ Zibart, Eve (August 19, 1988). "No Slickee, No Stoppee". The Washington Post. p. N21. ^ Molenda, Michael (March 2004). "The 2004 Guitar Player Readers Poll". Guitar Player. pp. 58–62.